Today, we are announcing three new features in Microsoft Teams to help Firstline Workers do their best work. Firstline Workers are more than two billion people worldwide who work in service- or task-oriented roles across industries such as retail, hospitality, travel, and manufacturing. We’re expanding Teams with new capabilities to digitally empower the Firstline Workforce. Today’s news includes: a customizable mobile experience with mobile-only features such as location sharing, a Graph API for the Shifts scheduling tool, which provides integration between Teams and workforce management systems, and the new Praise feature that makes it easy for managers and employees to recognize their coworkers right within Teams. For Firstline Workers, such as retail associates, flight crew members, and field service workers, being mobile is the nature of the job. Because these employees often need to share information with others inside their organization, many have resorted to using unsecure consumer chat apps to communicate with coworkers. But this poses security and compliance risks, as well as process inefficiencies. Today, we are announcing a new customizable mobile Teams experience that gives Firstline Workers the tools they need to communicate and collaborate effectively on the go. It’s simple, familiar, and secure, with several new mobile-only features that have particular relevance for Firstline Workers, including location sharing and smart camera, as well as the ability to record and share audio messages. The customizable mobile experience is available starting today. Workers need different capabilities depending on their role. While some might need access to private chats, calendars, and calls, others may only need access to teams and channels. IT administrators can now give each employee role-based access to the primary Teams features they need. This capability can be used for employees in any role, with the option for IT to create a custom policy or use the newly available Firstline Worker configuration policy template. Employees can further customize their experience by pinning the modules they need most from their module tray to their navigation bar. Many companies rely on workforce management systems to handle important operational tasks related to their Firstline Workforce, such as shift scheduling, payroll, benefits, time, and attendance. We’re working on a set of new APIs that enable organizations to integrate their existing workforce management systems with Teams. The first API is the Graph API for Shifts, the schedule management tool in Teams. 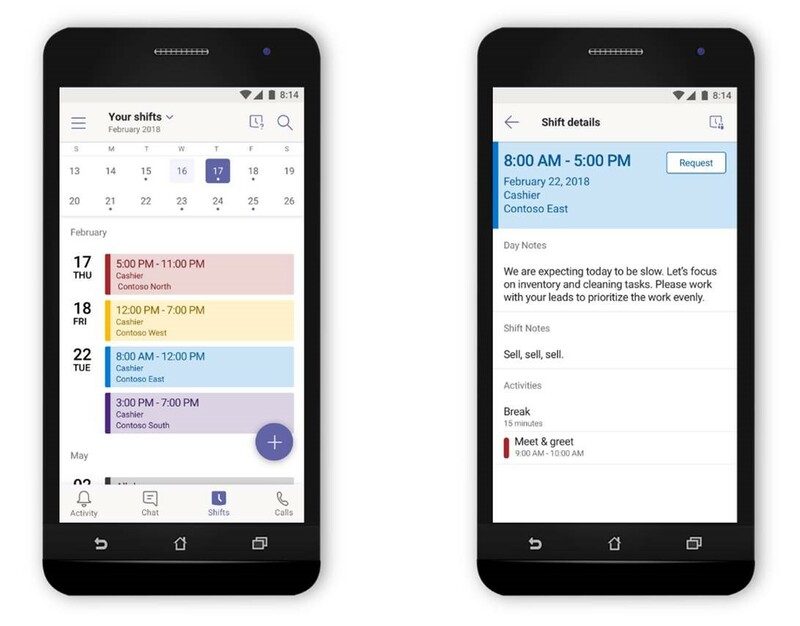 With Shifts now available in Teams for all customers, the new API makes integration between Shifts and enterprise scheduling systems possible, enabling seamless access to workforce management systems for managers and employees, right from Teams. The Graph API for Shifts will be in public preview this quarter. With Shifts, managers can easily plan shift schedules, and team members can review schedules and make schedule change requests, all in real time. Firstline Workers such as retail associates play a key role in representing a company’s brand, but this segment of the workforce experiences some of the highest turnover rates. Taking steps to engage and recognize employees can go a long way to improving their satisfaction and reducing turnover. 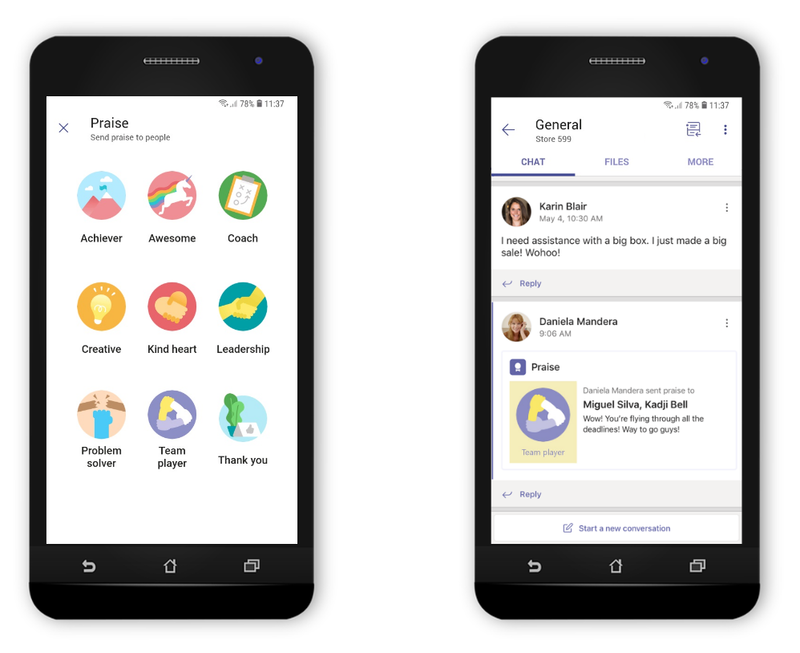 The new Praise tool, rolling out this quarter, gives managers and employees a simple way to recognize coworkers, right in the Teams app where the whole team can see it. 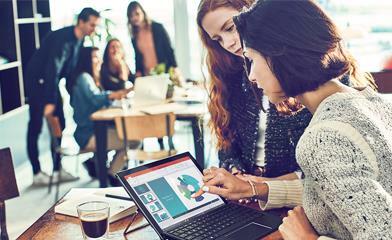 Next week, members of the Microsoft team will be at NRF 2019, the annual retail industry conference. Visit us in booth #3301. Also, please visit our Teams for Firstline Workers page to learn more about how Teams can empower your Firstline Workforce.